An apprentice or craftsman works on the last of eight pentacles that he has created, the other hanging completed. To understand this card, we might well go all the way back to the Three of Pentacles and the story that developed from there. 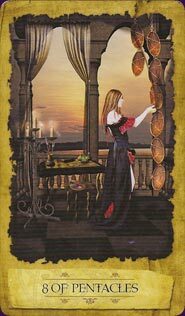 We saw the craftsman gaining patronage, which led to an abundance of funds to hold tight to in Four of Pentacles. Alas, the craftsman lost it all in Five of Pentacles, but generosity saved him in the Six of Pentacles. In the seven/pents he stood his ground, waiting and watching for a fresh opportunity. Now that opportunity has come in the Eight of Pentacles. This card could, in fact, indicate a new job or new training. A new investment or new workout program. In some interpretations, the querent might be at a lower level than he was, going through an apprenticeship. This might be a little demoralizing, but there is still gratitude for the employment. Either way, there are clearly no patrons this time to finance him; he is working hard to prove something to himself and his new employer, not to impress rich backers. Seeing it from another angle, it is working out at a local gym rather than at a expensive fitness center, and working out for your own good not in hopes of impressing anyone. This card is about diligence and limiting your work to a particular project. It is doing your best not to show off what you can do or in the hopes of something more (as in the three/pents for patronage), but because you want to take pride in your work. To this end, whether learning this skill or already a master at it, the querent will (or should) pay attention to details, research, train, and do whatever else is needed to feel that their work goes above and beyond. Even if no one else notices, they will know that they have taken themselves to a higher level. Learn the Eight of Pentacles tarot card meaning and the rest of the card meanings, symbols and stories in our eBook.